It's every woman's nightmare. Going gray. Not really, but the prospect of going gray can be daunting to many women, especially in this country obsessed with looks and youth. Other women? Not so much. Just look around you for confirmation. Anne Kreamer's revelation at seeing a photo of herself with dyed hair? "...the dyed-hair forty-nine-year-old" made her feel that she wasn't looking at the real Anne. Not too many women have that reaction. Just look around you. 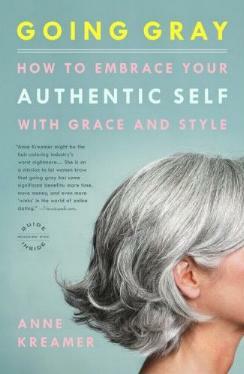 Kreamer's humorous (and serious) look at herself, and others, will keep you chuckling, especially if you have a few gray hairs or are battling to keep a head of gray hair from the world. She also talks about the lengths women [mostly Western women] will go to in an attempt to halt the march of time. It's basically all about looking younger and more pleasing. It is interesting to read the answers and reactions to Kreamer's many questions to friends and the like, about coloring or going gray. As you would expect, a lot of the book is about how the "older woman" is thought of in the corporate world (appallingly), and the lengths (fashion and beautywise) some women go to in order to fit in or just to get a job. The bottom line, in my opinion, the world's not going to end because you decided not to color your hair - you're being your natural and authentic self by not following trends. What could be better? Conclusion - A thorough look at why women color their hair to fit in, and the best of all, her self discovery. Please read my blog on going gray.